Genetic counsellors also provide supportive counselling to individuals/families with sensitivity to ethnic and cultural diversity and they address potential ethical issues. Furthermore, they serve as patient advocates and refer individuals and families to available support services. 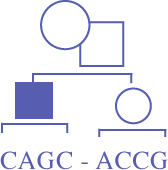 Genetic counsellors serve as educators and resource people for other healthcare professionals and for the general public. Increasingly, genetic counsellors are working in non-traditional roles within both public and private health related institutions. These roles include administration, marketing, consulting, and activities related to research in the field of medical genetics and genetic counselling.